Your website is oftentimes your number one marketing tool, making it important to provide your visitors with an amazing experience! A Website Optimization Sprint helps you understand how your users interact with your website, giving you the insights needed to optimize their experience. Test out new design and layout concepts, get real time feedback, enhance your navigation and optimize your website for your consumers. Digsite participants use a combination of discussion, photo/video uploads, survey responses, and image mark-up activities to optimize your website. 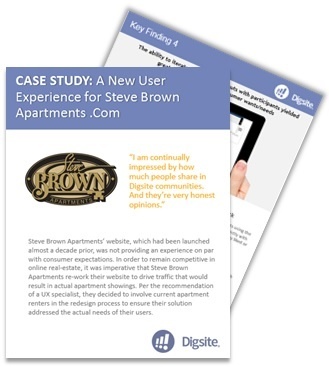 Steve Brown Apartments, a property management company, was looking to differentiate itself in from competition in the real estate market by developing a website experience that would be easier for potential renters to use and more likely to translate into actual apartment showings. 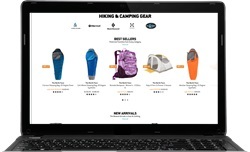 Using a website optimization sprint, Steve Brown was able to actively engage with a group of users on new wireframes, imagery and navigation to build a better experience for their customers.